I reported on the case of the courageous Ursula Haverbeck earlier in the year HERE. Germany is obviously not run by Germans for we see now that the “authorities” have sent her down for 10 months for questioning the holocaust. Think about this. Irrespective of what you may think of her views, for merely calling into question the holocaust narrative, she is imprisoned. Does this not suggest, clearly show even, that she is by inherent logic, right ? Why lock someone up when they could simply disprove her assertions using facts, unless of course said “facts” were likely to turn out to be manure. Truth fears no enquiry . . . but german authorities do, or so it would seem. 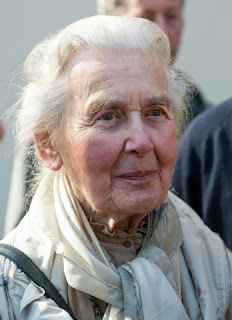 Hamburg District Court, Nov. 11, 2015 — 87-year-old Ursula Haverbeck has been sentenced to imprisonment in Germany for doubting that people were “exterminated” by “gassing” in the Nazi concentration camp in Auschwitz. The defendant, in good spirits, reiterated her doubts in the courtroom. She arrived without a lawyer, and defended herself. Some fifty of her supporters crowded the courtroom and the hall outside. She was accused of giving an interview to the German magazine Panorama in which she stated that Auschwitz was not an extermination camp but a labor camp. The mass murder of Jews had not taken place, she said. The German government prosecutor maintained that the defendant’s “fanatical delusion” had not abated and that, despite her advanced age, Ursula Haverbeck must be sentenced to 10 months in prison without parole. The judge agreed and the sentence was imposed. In 2009, Haverbeck was fined thousands of dollars in the District Court of Bad Oeynhausen, for having given offense to Charlotte Knobloch, president of the Central Council of Jews. Hoffman is the author of The Great Holocaust Trial: The Landmark Battle for the Right to Doubt the West’s Most Sacred Relic, and the publisher of Johann Andreas Eisenmenger’s Entdecktes Judenthum. ← Did the Holocaust Really Happen ? 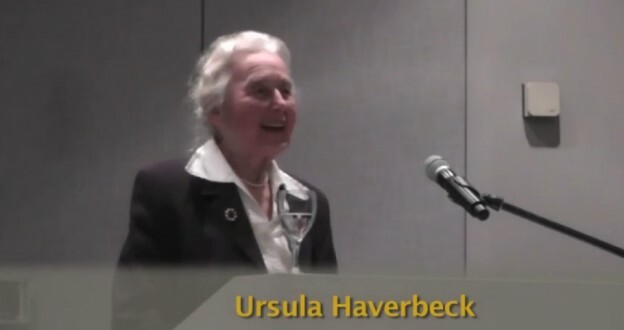 Ursula Haverbeck is a very courageous elderly woman who seeks to assert the truth and remove the terrible stigma forced upon the Christian German people by hypocritical and lying warmongering Allies of an unnecessary, barbaric and chaotic war. This verdict is a travesty of Human Rights and Justice and a gross mockery of any democratic system. A new Inquisition revival based on fear is another footprint towards NWO tyranny.